Strawberry Studio is the micro/filler game producing line of NSKN Games. So far in their catalog, they have produced 3 Wishes and What's Up. The third upcoming game in their catalog is Strawberry Ninja (fitting name, given the studio's name). Strawberry Ninja is a cooperative game for 1-4 players, ages 8+. It takes 20 minutes to play, and you can pledge for a copy on Kickstarter for $10. (You read that right...$10!) In this game, you and your fellow farmers notice that produce is vanishing from your garden. It's the notorious Strawberry Ninja! You must guide your brave cat towards the ninja and help him apprehend the culprit before twelve turns expire. 1. Shuffle the Strawberry Field cards together and set aside ten randomly. 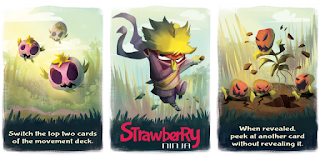 Add the Strawberry Ninja card to these ten cards then shuffle them together. 2. Use this deck to form a 4 x 3 face-down grid, leaving one space open. 3. Place the Kitty Pawn on one of the face-down cards. 4. Shuffle the Movement cards together and make a face-down deck. 5. Place the Round Tracker card on the table with it marked on position one. 2. Shift a different card that is adjacent to an empty space into the empty space. Same rules apply as above. 4. Reveal the top card of the Movement deck, and move the Kitty according to the direction on the card. If it would move the Kitty off the grid, skip the movement. Then, move the round marker to the next position. 5. If is it the final round (Round 12), you must pounce! Otherwise, this action is optional. Reveal the card the Kitty is on. If you reveal the Strawberry Ninja, you caught him! If you reveal any other card, he escaped! 6. After pouncing, reset the game according to setup. You win if you catch the Strawberry Ninja twice, and you lose if he escapes twice. 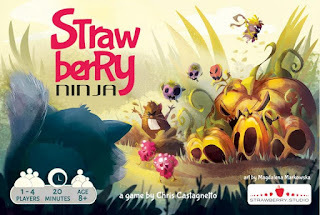 Strawberry Ninja is a cute little cooperative game that is fun for the whole family. It is quick to play, simple to learn, and doesn't take up much shelf or table space. With the grid shifting twice per turn, a random assortment of strawberry field cards, and different resolutions on each text, each game will be just a little different. I especially like the gopher cards that act like a secret passageway to each other. I must admit that I'm not a huge fan of the artwork, which is surprising because it is the same artist as their first two games. My wife and I agree though that the eyes on the cards look a little creepy. This might be a turn-off for some kids. That niggle aside, the game play is solid, and this is a very light introduction to cooperative play for young children and people new to gaming. Strawberry Studio once again proved that they know how to get the most amount of game play from such a small set of cards (19 total). I look forward to the many games they will come out with and can't wait until we get to see Pyramid of the Sun.